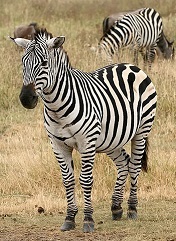 Home » Science Notes Posts » Biology » Why Do Zebras Have Stripes? Why do zebras have stripes? That question has been around probably as long as people have studied zebras. Do they help a zebra find a mate? Do they act as a natural camouflage as they run from predators? Do they help a zebra stay cool in the hot African sun? Do they act as a natural pest control? There is evidence that zebra stripes do all these things, but which one makes the most sense? Nature Communications reports on a study which shows pest control may be the winner. They found the range of zebras and the annoying, biting, disease-carrying flying tse-tse flies are nearly the same. These flies are known to torment horses and other animals year-round and transmit a variety of equine diseases. Studies have also shown flies prefer to land on uniform surfaces over striped surfaces. It makes ecological sense to have a set of stripes if you would rather not have flies on you. Too bad human stripes don’t do the same thing with mosquitos. ← Eat Chocolate to Prevent Obesity?